Bisphosphonate-related osteonecrosis of the jaw (BRONJ) is associated with the use of bisphosphonates to treat severe osteoporosis, and metabolic and oncologic bone conditions, including hypercalcemia associated with malignancy. These agents inhibit osteoclasts, reducing bone resorption and osteolysis, and also possess antiangiogenic properties, reducing blood flow and necrosis. Patients with BRONJ present with pain and exposed, nonvital bone involving the maxillofacial structures. The incidence of BRONJ increases with the duration of treatment, especially with the intravenous route and concomitant steroid therapy. The osteonecrosis usually is participated by dental extraction. When spontaneous, it commonly occurs along the mylohyoid ridge. BRONJ can mimic osteomyelitis and osteoradionecrosis. A history of dental caries and the presence of periosteal elevation can help direct one towards the diagnosis of osteomyelitis. Osteoradionecrosis can be excluded if the patient has not received oropharyngeal radiation therapy. Jaw neoplasm, primary or metastatic, can potentially also mimic BRONJ. Treatment of BRONJ consists of cessation of bisphosphonate drug therapy, antibiotics for secondary infection, and surgical debridement of necrotic sequestra. 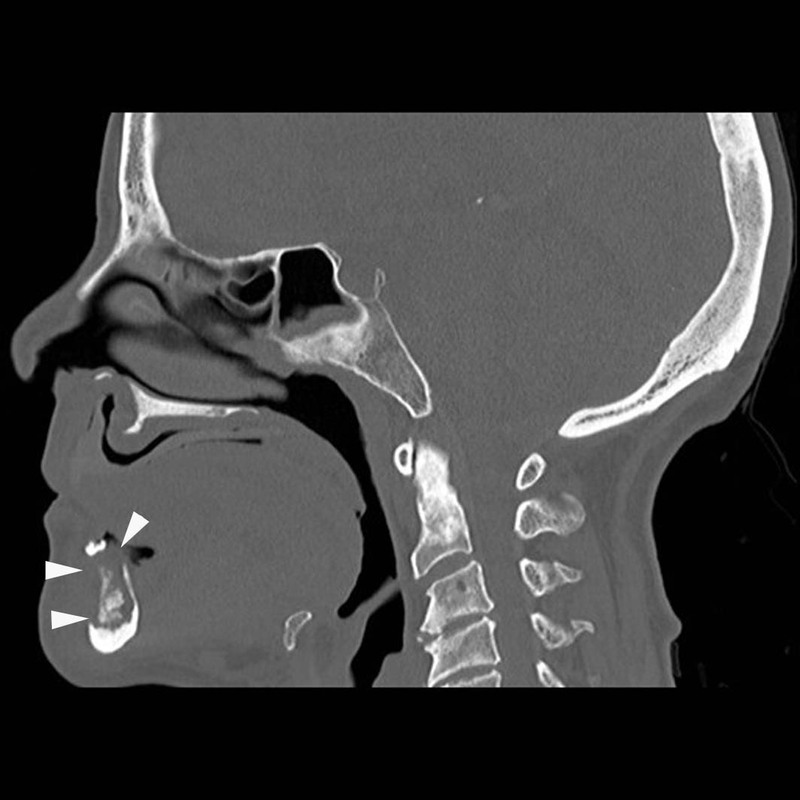 Figure 1: Axial CT of the facial bones. There is a mixed sclerotic and lytic lesion within the mandible (Figure 1, arrows) with foci of cortical interruption (Figure 2, arrowheads). Figure 2: Sagital CT of the facial bones. There is a mixed sclerotic and lytic lesion within the mandible (Figure 1, arrows) with foci of cortical interruption (Figure 2, arrowheads).